In the last part of the series, I would like to introduce two very interesting additions that extend the capabilities of Application Insights: Glimpse and PowerBI. Glimpse is a tool that can be used during the development of web applications. I like to call it “a real-time head-up-display profiler”. 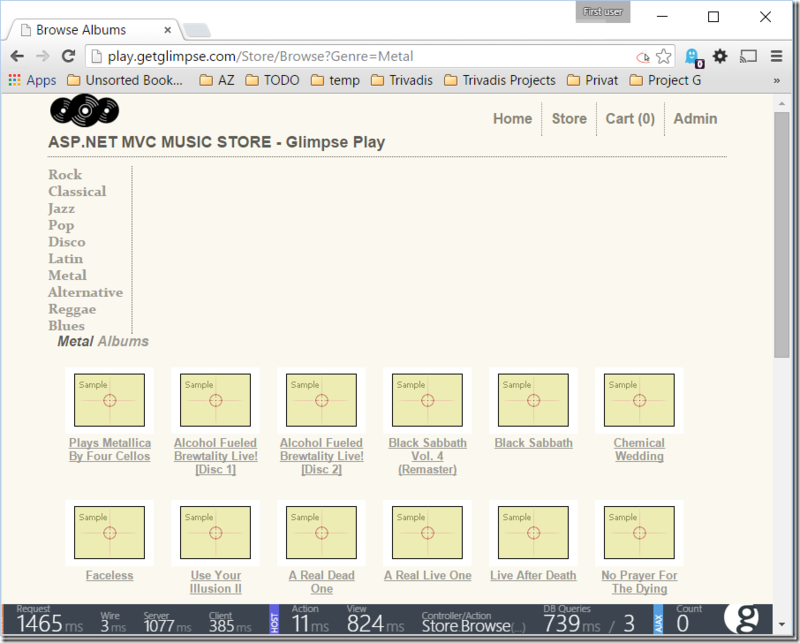 Suppose that you are working on an ASP.NET MVC application, glimpse opens a head-up display inside the browser when the browser navigates to the website. The display shows key performance metrics such as the response time of that request and other metrics. 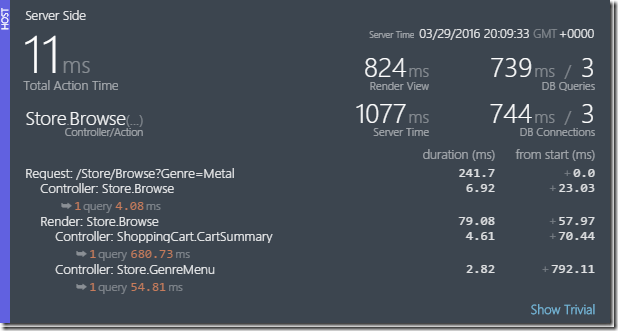 By clicking on the popup it opens up and shows more detailed performance metrics. If you are using ASP.NET MVC, it provides you with a break down of all the time spent in your controllers and actions down to the database, all for the specific request that you just executed. Glimpse captures it all. Clicking the Glimpse Icon opens Glimpse as a full window and gives you a lot of information about topics such as Cache, Configuration, Environment, Execution, Metadata, Requests, Routes, SQL and many more. Think of it as the browser developer tools on steroids! I mention Glimpse in this blog post because If your application sends telemetry data to application insights, it will catch these as well. All the Application Insights data shows up in the new “Application Insights” tab. 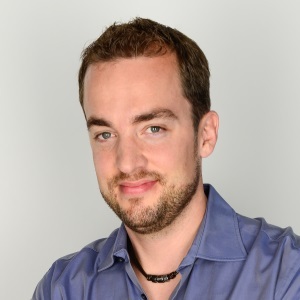 PowerBI is a self-service BI solution that lives in the Office 365 evironment. It is thought to be a tool for powerusers who want to analyze data without the need for a complex BI project. It allows a user with Office-Skills to build reports and dashboards on a predefined data set. PowerBI delivers a very compelling user experience and enables the user to create complex data analysis tools with just a few clicks. In order to create a dashboard in PowerBI, a data source must be connected. The data sources in PowerBI are called DataSets and can be selected from a catalog. Luckily, connecting PowerBI to an Application Insights is a matter of minutes. 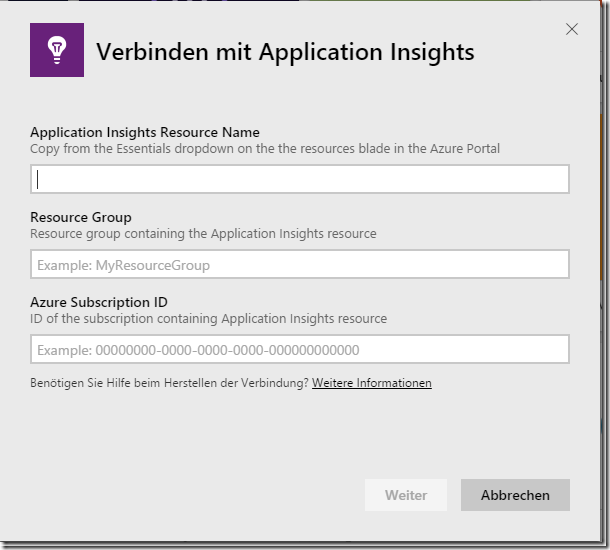 In this post I will show you how I connected the Application Insights instance that monitors my blog www.manuelmeyer.net to PowerBI. Once the data is entered, click the button and give it a minute. Then, suddenly, a beautiful dashboard appears! 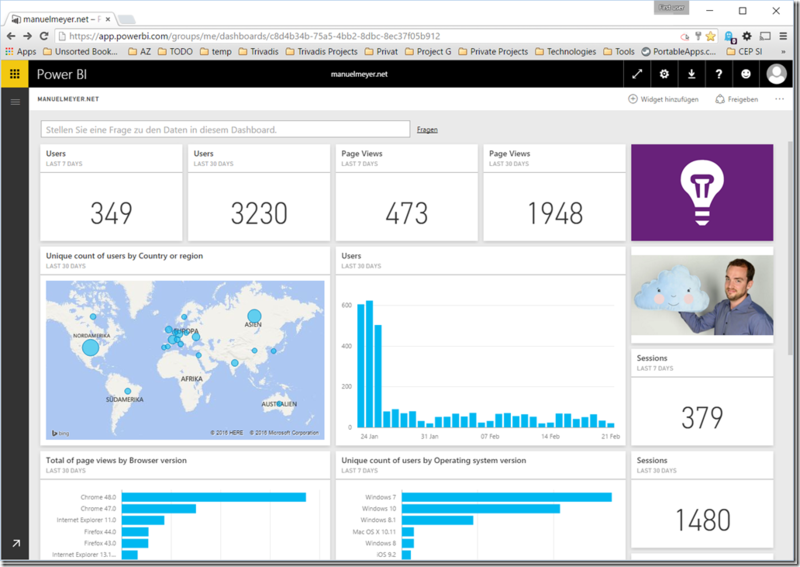 Take a moment to consider that I did not do ANYTHING to get this dashboard except for hooking up the Application Insights instance to PowerBI (and adding the image of myself…). It really surprised me how much value I got very little effort.